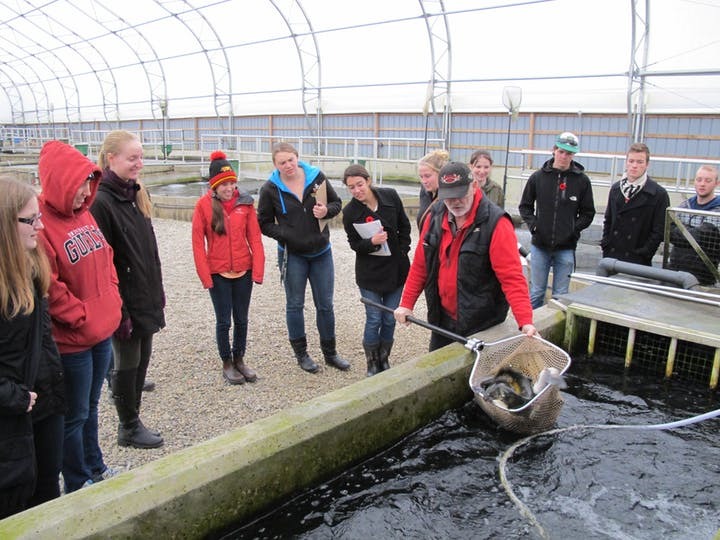 Please join the Alma Aquaculture Research Station and the University of Guelph for a one-day workshop on getting started in aquaculture and aquaponics, including presentations and a tour of aquaculture facilities at a research station. This one day workshop is intended for novices who are interested in aquaculture and/or aquaponics. The workshop investigates the key requirements of initiating and operating an aquaculture operation. More information can be found at the University of Guelph’s Aquaculture Centre Website. See up close, a large-scale research farm raising rainbow trout, Arctic charr and sturgeon. From water supplies to waste management systems, you’ll get a chance to view many of the bits and pieces discussed during the lecture sessions. Information is presented in a lecture format and is followed by a tour of the facilities at the Alma Aquaculture Research Station. The workshop fee includes all lectures, a tour of the Research Station, coffee breaks and lunch. Attendance is by pre-registration only, registrations will not be accepted at the door. In instances of very low pre-registration, the workshop may be re-scheduled to a later date. Registrants will be contacted should a re-scheduling occur. The Alma Aquaculture Research Station is funded in part by the Ontario Ministry of Agriculture, Food and Rural Affairs.